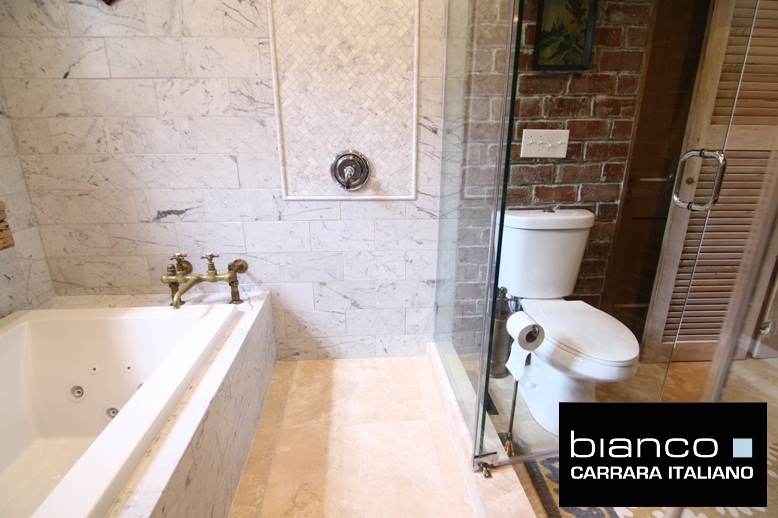 While we focus primarily on complete bathroom projects at the builder depot we have noticed an increasing demand for Carrara kitchen backslashes. 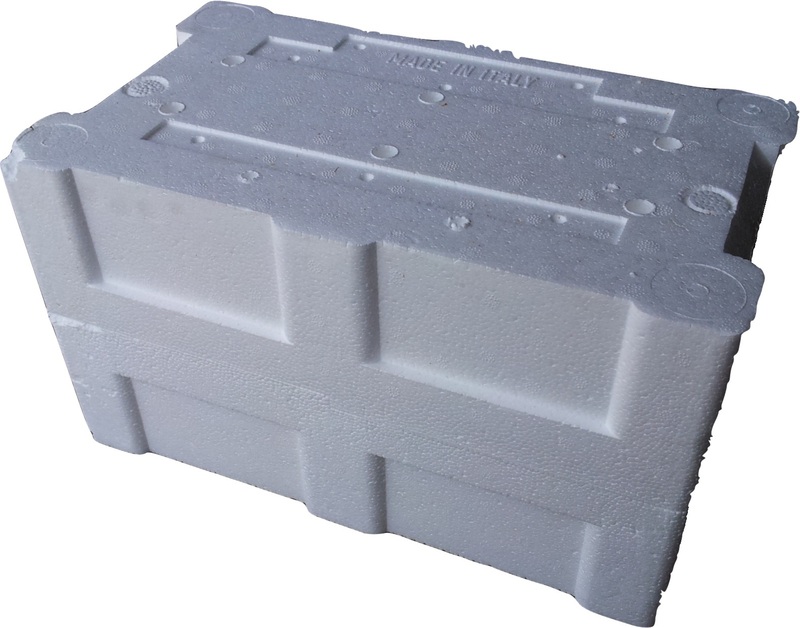 Our 3×6″ is not easy to ship in small quantities via UPS ground, the 2×4″ version attached on a mesh mosaic is flexible and allows for smaller quantities to be shipped without or limited the risk of damage. One of the most requested products for kitchen backslashes is the 2×4″ beveled design, it just gives more dimension to the look and of course feels nice to the touch. You will notice that everyone who visits cannot resist touching the backsplash. 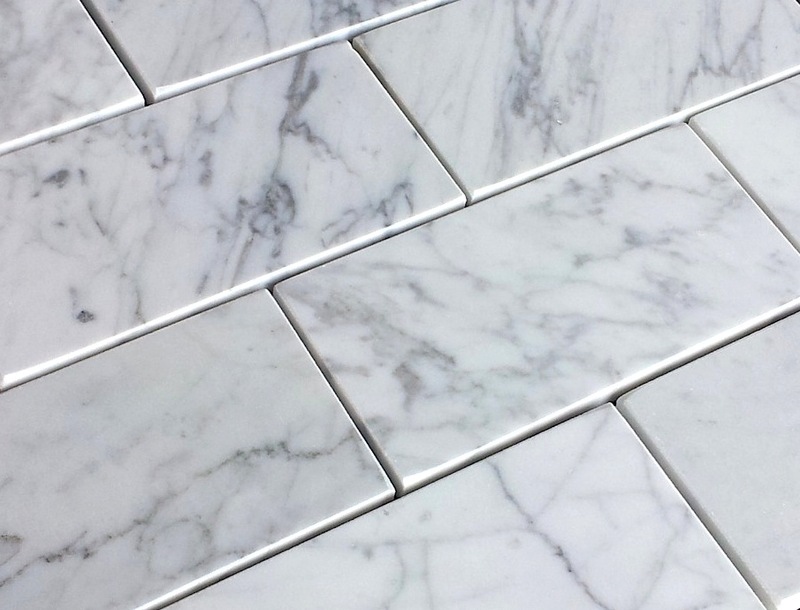 Carrara 2×4″ beveled mosaic tile gives any kitchen a stunning modern yet classic look. This product will be part of the Carrara Venato collection and available in the Fall of 2012. 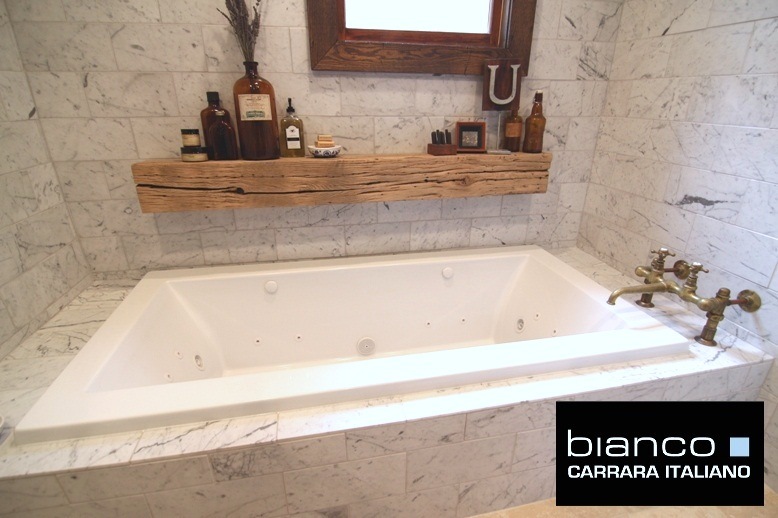 People often ask what is the difference between Carrara Venato and Carrara Bianco. 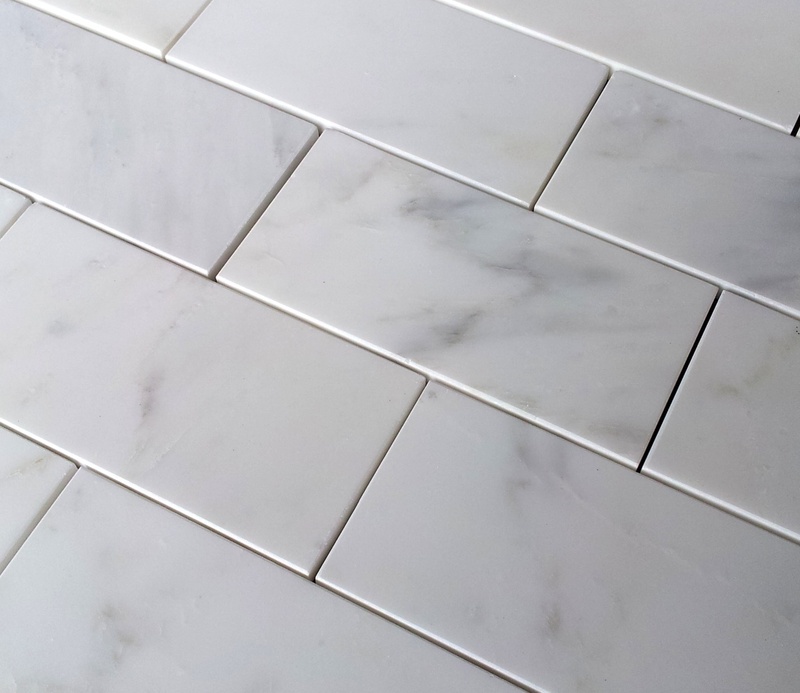 The objective of Venato is to create a whiter look to that of traditional Carrara and the objective of Bianco Carrara is to create the traditional Carrara look that has always been extremely popular. 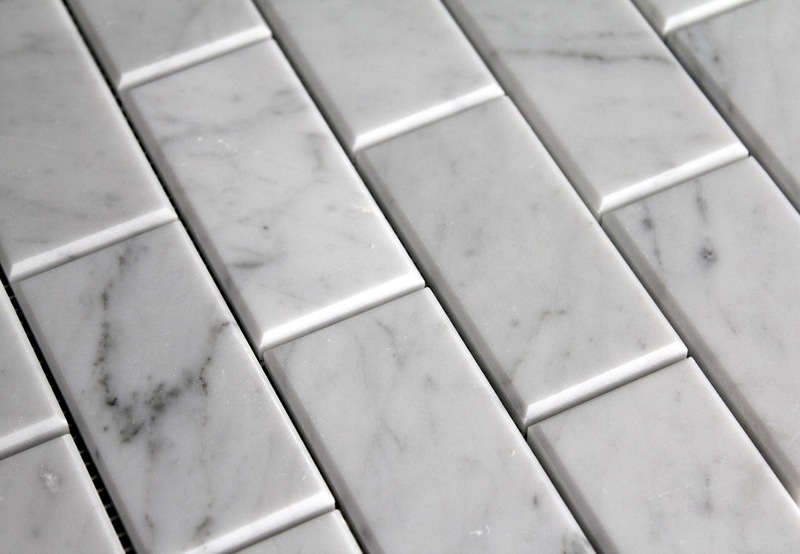 Venato Carrara is another option and look. It leans closer to a statuary than classic Carrara incorporating tiles without veining creating an overall whiter appearance. Whichever collection you choose to go with you will not be disappointed, with incredible price points and a plethora of mosaic and trim choices we are sure you will be able to create a dream bathroom at a price far lower than any traditional high end tile and stone retailer. 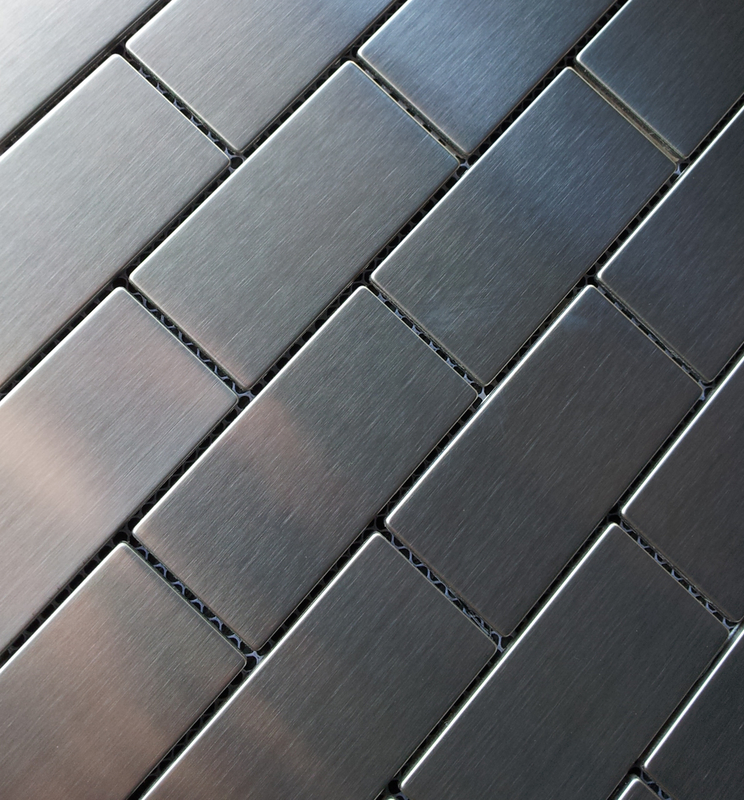 Premium 304 stainless steel 1.5 x 3″ metal mosaic promotion for July 2012 of $14.95SF including free shipping. Each sheet covers one square foot. If you are interested in this product you can buy online buy clicking here. We are often asked this question and we do ship to many Canadian customers. I would say 90% of them ship to a location in the USA and then bring it over themselves. For smaller orders 50SF of 2” Hexagon (for example) many select a UPS store in the USA. We ship there and the customer picks up. This method works particularly well on Metal items, as they ship for free in the USA. The customer ships to a UPS store and then picks up their order. To place the order just enter the shipping location as UPS store (followed by address) and then in the comments add any notes or reference number you would want on the message. For freight orders (those orders that include field tiles or are larger than 100SF) the majority of Canadian customers use terminals close to the Canadian border. For example Roadrunner is one carrier. You could select “pick-up” from terminal and collect from the USA. For those customers looking to ship direct to Canada. This is where it get’s expensive. 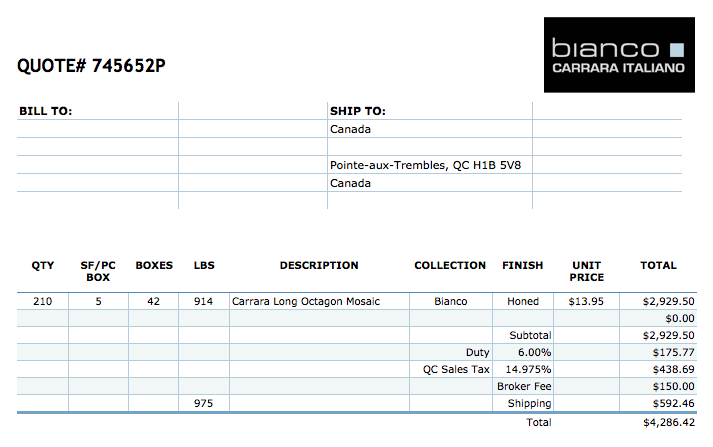 Figure 1 is an order quoted shipping direct to Quebec. You can see it picks up a Brokerage Fee (which you could avoid by collecting yourself) and the freight is very high. This is because Roadrunner will ship to the USA terminal. Then another carrier (a Canadian company) may pick up the order and then drive it to your residence. The two shipping companies ncreases the shipping astronomically. We could ship to a Buffalo NY terminal freight for $175.00. Ship it over the border and it is three times the cost (almost). Yes another delivery arrived Monday 9th of July. So first thing after it was unloaded (full container of tiles from Italy) pictures. I only had time to get pictures of the 6×12″ but this matches the 12×12″ that came in at the same time. This shipment is impressive, great veining and really nice looking Italian marble. The thing about these tiles is the cut – the Italian just take the time over making sure the edges are factory beveled with a slight micro-bevel. The packaging is impressive as well. It just ensures that when the product arrives at its final destination there are no scratches or cracks. 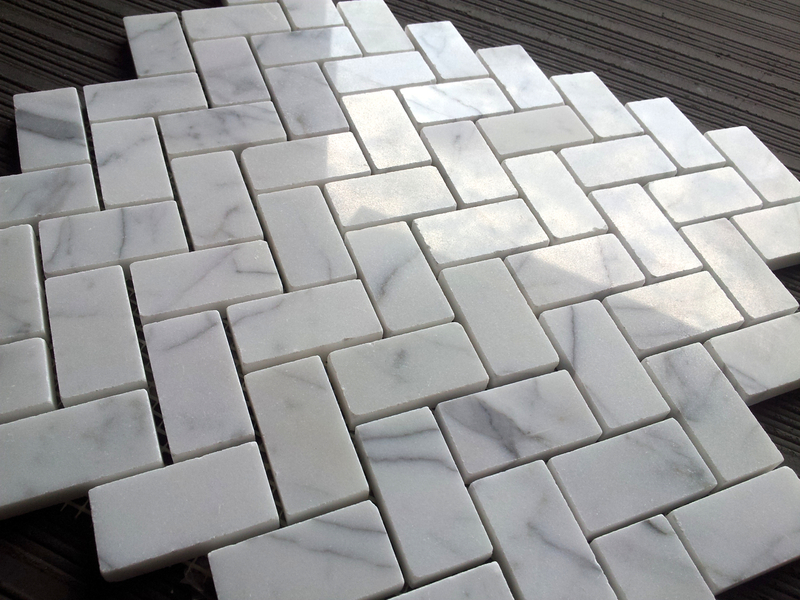 Other suppliers sell loose tile, or material from Turkey, anything to cut costs so they can compete with us. We operate a very efficient business model and are willing to accept lower margins so our customers get the best possible Italian Carrara. If you are interested in this particular delivery there is approximately 1,200SF left of each product (as of July 9th) not very much a lot gets backordered prior to arrival. Please email us at sales@thebuilderdepot.com and reference “6×12″ arrival July 9th”. 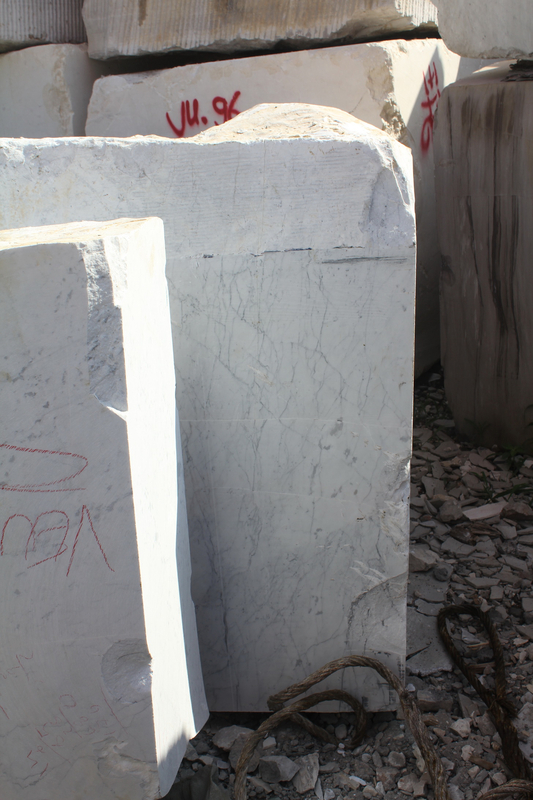 We will always try to get more inventory but we can only get more once we find the correct quality of blocks from Carrara Italy. Stock is always an issue at this quality level. 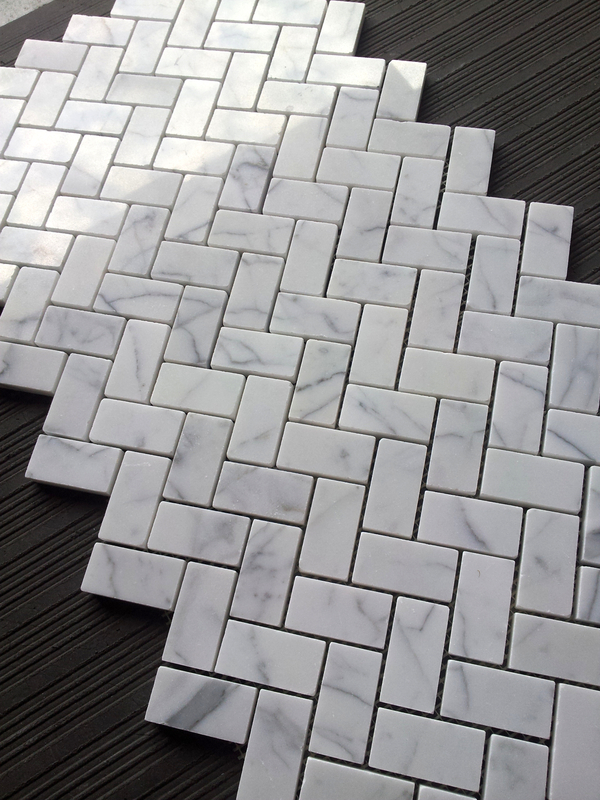 From Carrara blocks to Carrara Herringbone below. We select the best blocks. 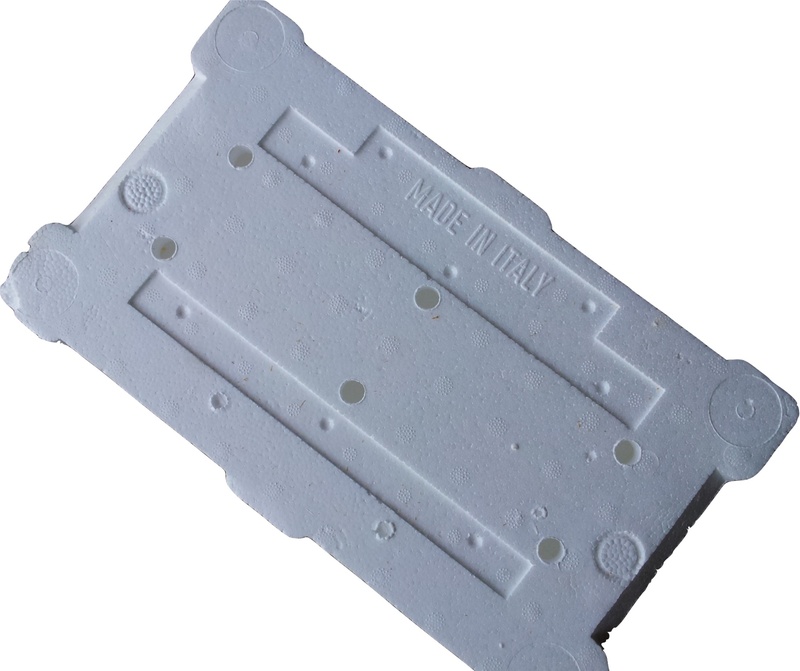 This is the key to our quality we are involved in the entire process from quarry to consumer.